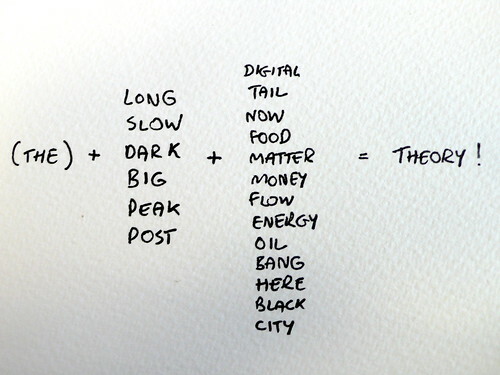 A year ago, Russell posted his sketch for the Future-o-Matic Theory Maker. I think at the moment, there is little need for any column except the second one. I have noticed quite a lot of Peak Slow and Post Long recently. These are mostly as attempts to mediate content overload, such as the trend towards #longreads in blog posts and Russell’s own reshaping of Interesting this year. Of course, the Big Dark is never far away. It’s been a bit quiet here lately, my apologies. To make it up to you, I am going to republish a post I wrote for the Mudlark blog recently. It’s about an iPhone ‘game’ that’s a year old, but accidentally touches on some interesting ideas. Or it’s easy to extrapolate them from the game. Read on if you like. but I wanted original content!